Grenada is one of our weaves made from 100% jute with a modern zig-zag pattern that freshens up any environment. 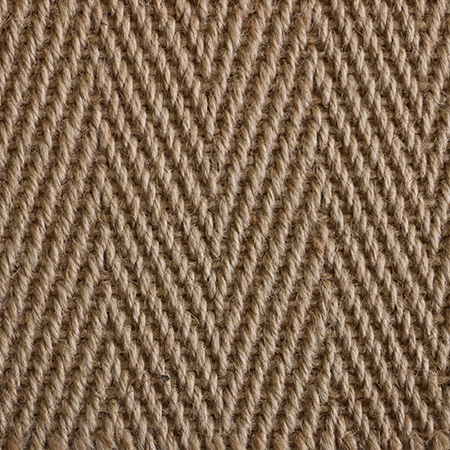 Jute, a natural fiber produced from plants, is soft to the touch but spun into strong threads. In addition, it is 100% bio-degradable and recyclable and thus, belongs among the most environment-friendly fibers. Broadloom for wall-to-wall installation costs $60 per sq yd. The roll width is 13'. For more information or to create a custom rug, see rug builder below. Freight is free with all rug orders. 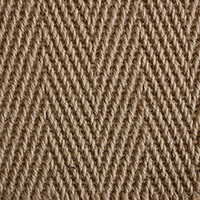 Natural, undyed jute varies in color from light tans to light browns. Each rug will show this entire color range. In time, all jute rug exposed to sunlight will change in color. Due to the handcrafted construction and unusually thick yarns of this product, there can be sprouting, bowing, and skewing up to 2-3" every 5-6 linear feet. This natural variance is a beautiful feature of all jute products.